Excellent job. Lightmaps ad alot of realism to a model. Have you examples of - more or less - shadows in vrml ? but nothing about shadows . If I am not wrong . and he told me that it is a prob for the puters to get them . You mean for example the shadow of a tree which is moving when the tree is moving too ? They have but it takes more prims (something like polygones) and you know they are limited by the number of prims in a sims (world). So they have to make some choices when they decide to build something. Unfortunately, shadow/light mapping has been seldomly used in VRML, but it has been allways possible (even under VRML 1.0). Shadowmaps (and other) are a 'production-time' job ... I mean, you must do the job on your modelling software, and you must be good with it. Nothing will do the job for you later, during 'run-time'. This ability, combined with a good understanding and usage of standard VRML lights and materials (Griff! ), have given the (visually) best worlds to VRML. 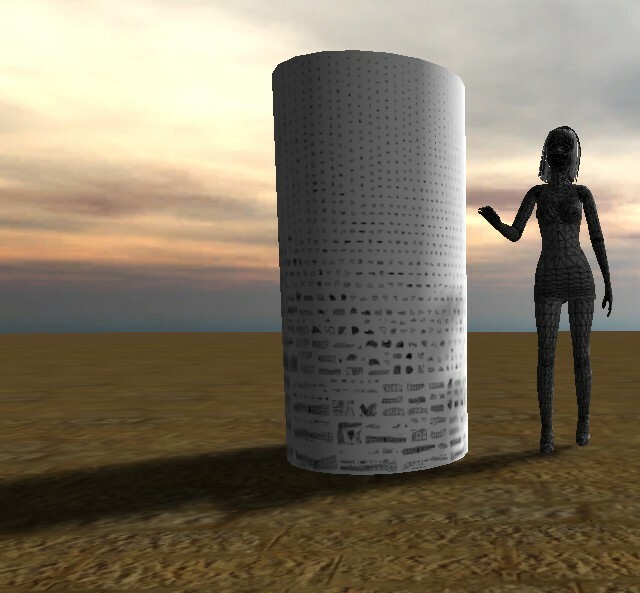 2) if the rest of the world - it's textures and lights - are poorly done, the result will still be as poor as a traditional 'cone-cylinder-box' world..
Resuming : the features of 'modern' vrml-x3dviewers are less important than the artist's skills. It's true that all the real work is done in the modeling stage, unfortunately some of it can create fairly large texture files, but if done right, it looks great. Here is a humble sample I played with using lightmaps and animated lighting to get the desired effect. ... yes, those are nice, subtile, shadows. And nowadays, whilest people are watching HD videos on youtube, we should not bother about filesizes that much. The upper limits of poly-count have also been shifted by modern bandwidth and hardware. It has been said repeadetly - and I agree : VRML was born before it's time. May be the first time I saw lightmaps as pics , it was with the Chrysagon's tavern . I always tought these images strange and beautiful . I wanted to get that in 3D vrml . I got some after years .Small ones . Now I think that they are enought beautiful as images . It is a way to show 3D in 2D LOL . mixed with some I did . 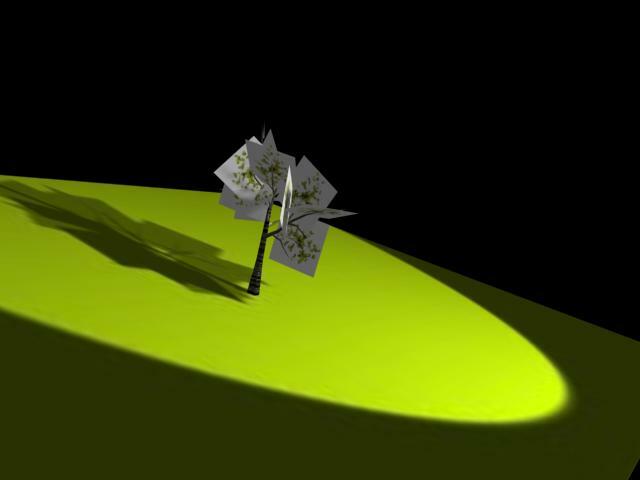 to resume : " put real life on it "
I tried to enter it in 3DSMax , to make shadows . 1 - First problem : having the gifs leaves with the transparency ! ( I tried too with pngs , but same prob . 3 - I wonder if we could save gifs when Rendering to Texture the ground . I saw on some forums that it seems not , and tried avi but didnt succeeded . After all that I used the sort of way Olivier Lunot - Tidus used in his Park for JOI . I added a flat shape with a gif for the shadows . But more exactly Tidus moved a jpg as texture of the ground . May be better and easier if it is well scaled . but today was my first one with dynamic shadows on unity3d.